Radical Pedagogy challenges the paradigm of modern educational systems, conceiving education as an instrument for personal or collective emancipation. Politics and education intersect in the space defined justice and equity. The main concerns inspiring the Subtramas project stem from research into collaborative practices in cinema and art, an the need to reframe them as social practices of representation in terms of political and pedagogical experiments and cooperative methodologies. One of the starting points in our research is the idea of mode of address which Elizabeth Ellsworth imported from film theory and media studies to education. She posits that, as films are positioned to appeal to particular hypothetical audiences- with the aim of generating acceptance leaving no room for disagreement or rejection-, teachers, too, address their students in order to appeal to who the teachers think the students are. However, while the mode of address in film is a socio-semantic construct, in education it may function as a performative, and therefore opens the possibility of revising what we think we know about ourselves and others. Who does this film/ this school system think you are? Who is addressing you? From which power relationships are they addressing you? How are they addressing you in terms of class, race, gender, sexuality, etc? How does the mode of address change the way you watch a film/ you learn?. The Locked Room. Garth Evans, Gareth Jones, Peter Harvey (UK,1974)In the late spring of 1969 Peter Kardia, Peter Harvey, Garth Evans and Gareth Jones four members of the teaching staff in the Sculpture Department at St. Martins School of Art in London began work on a project for students who would be entering the new three-year degree programme in the autumn. Their unique pedagogic experiment, which came to be known as the ‘A’ Course, was an extraordinary and inventive teaching programme that had a significant impact on what was taking place in British art education at the time. The experiment tried to disrupt the students’ habits and all their previous training and preconceptions, confronting them with the ‘raw’ (physical as well as social) materials of artistic practice in the most authentic, unmediated possible manner. As tutor Peter Kardia said: “I wanted to put them in an experiential situation where they couldn’t grasp what they were doing. What I wanted was ‘existence before essence’”. Partly in response to what was deemed by some as a misrepresentation of the experiment in the BBC documentary A Question of Feeling (1973), this film tries to show what really happened in the Locked Room in 1969. The Radical Education Forum is a group of people working in a wide range of educational settings who meet monthly to discuss radical pedagogical theories and techniques, and contemporary issues of interest to those involved in education. The group work with theories and questions that inform teaching and learning practice. The Forum supports social justice in education, linking practitioners within mainstream educational institutions, community education initiatives, social movements, arts organisations and self-organised groups. Un elefante en la escuela Creciendo Junto/Colectivo Situaciones. 2008, Buenos Aires: Tinta Limón Ed. “ ‘Saturday Workshop’ is the name we gave to an ongoing experiment in which teachers and parents from the Creciendo Juntos School at Moreno, the EGB 105 School at Gonzalez Catán, and the Situaciones Collective have been participating for a number of years. The collective authoring of this book stems from a long, rather populous conversation that became a methodology in itself, a device for enunciating problems, feelings and very specific scenarios, allied with the power of thought.” [From the book’s back cover (Eng. trans. by José M. Bueso)]. This is a compilation of thirteen of Deligny’s most important texts tracing the stages in his journey from the psychiatric hospital in Armentières [northern France], where he worked as an educator during WW II, to Monoblet in the Protestant region of Les Cévennes [south of France], where, in 1969, he established a network to care for autistic children. In 2010, the Llamale H (“Call it H”) collective in Uruguay developed a participatory research project at some schools in the country. The aim was to open spaces for the discussion of sexual diversity and gender in schools, and to generate materials for students and teachers. The film Vestidos en el Aula, accompanied by a teaching guide, was the result of that project. 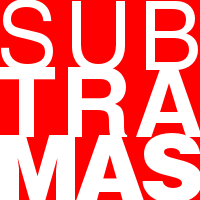 SUBTRAMAS. A research and co-learning initiative focused on collaborative audiovisual production. A Project by Diego del Pozo Barriuso, Montse Romaní and Virginia Villaplana. To contact Subtramas team click here.